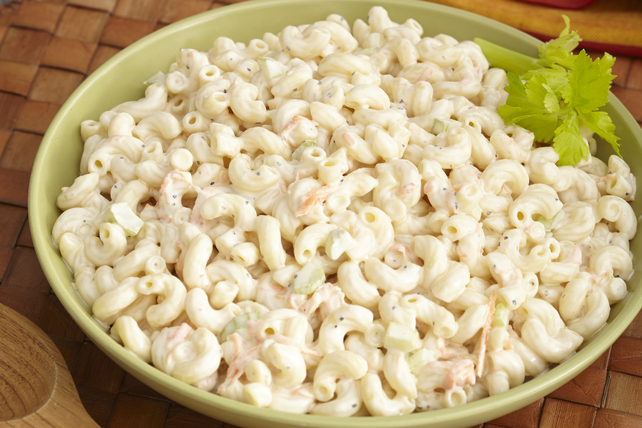 Enjoy the taste of a classic pasta salad with this Family Favourite Macaroni Salad. This tangy macaroni salad is the perfect side dish for backyard barbecues, potlucks or picnics. Cook macaroni in saucepan of boiling water 11 min. Meanwhile, mix Miracle Whip, milk, vinegar, sugar and pepper until blended. Drain macaroni; place in large bowl. Add vegetables and Miracle Whip mixture; mix lightly. Serve this pasta side dish with a crisp, mixed green salad tossed with your favourite Kraft Dressing and cooked lean meat, poultry or fish. This creamy salad can be refrigerated up to 2 days before serving.